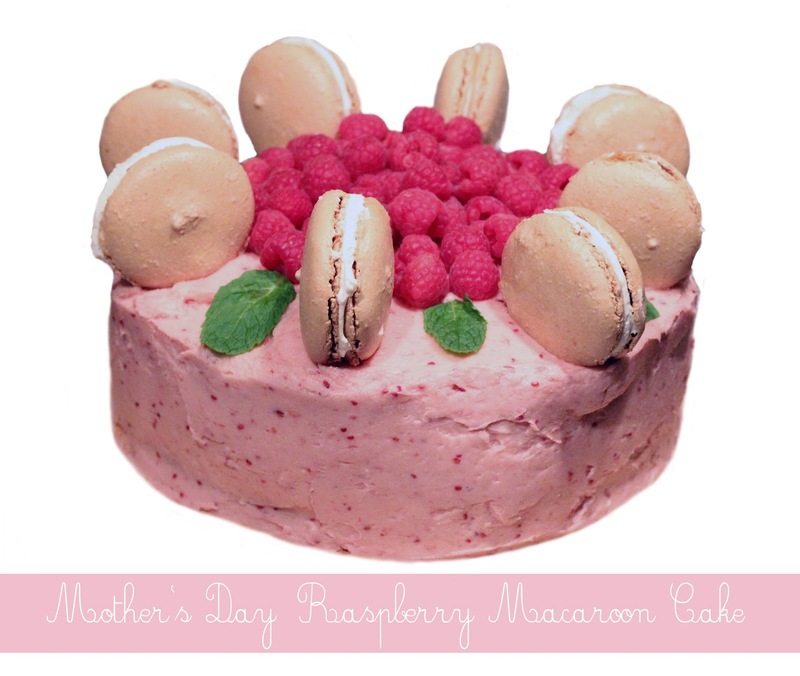 Mother's Day here in the UK is on the 10th March this year and if like me you like any excuse to bake, then Mother's Day is no exception. The format of this recipe post will be a little different to the usual as this recipe has a lot more stages than previous ones (also I was sort of playing it by ear as I went along...not so easy to plan if that's the approach you take!). The cake I made uses 2 of these sponge layers, so can either double the quantity and divide equally between two 7" cake tins or simply make the recipe twice. Source: Doves Farm. Preheat the oven to 180 degrees celsius and grease a 7" cake tin. Mix together the sugar, oil and vanilla. Add the banana and mash into the mix until well combined. Sift the in flour and combine, then add the water and mix until smooth. Pour the mixture into the tin and smooth over. Place in the middle of the oven for about 20-30 minutes. Remove and set aside to cool. Turn oven down to 170 degrees celsius. Place the shortening, sunflower spread and icing sugar in a large bowl. Drain the tinned raspberries, but save the juice. Add the raspberries and about 2-3 tbsp of the juice to the bowl. Using an electric whisk, mix the ingredients together until smooth. Add the agave nectar and whisk again. When the sponge layers are cool, place a small amount of the buttercream to the centre of the plate, stand or cake tray you choose and lower the first sponge layer onto it. This is to stop the sponge from sliding around. 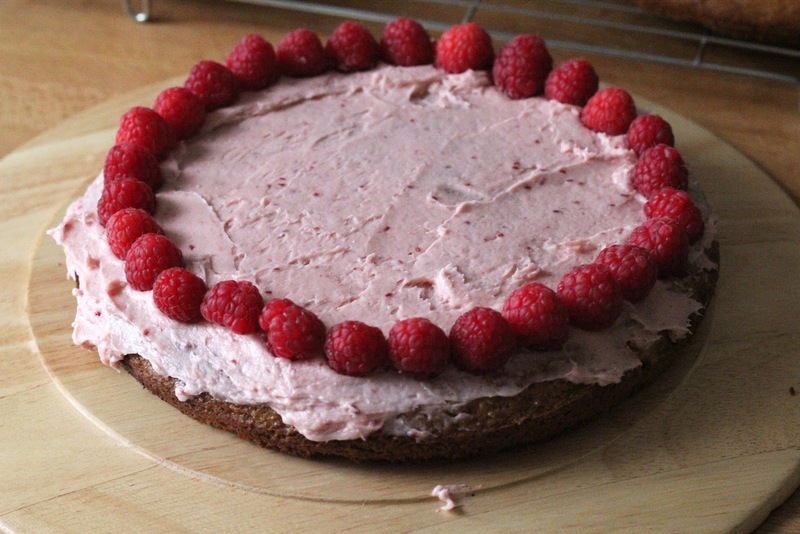 Spread a thin layer of the buttercream to the top of the sponge, then arrange the raspberries around the edge and working your way in to the middle of the cake. 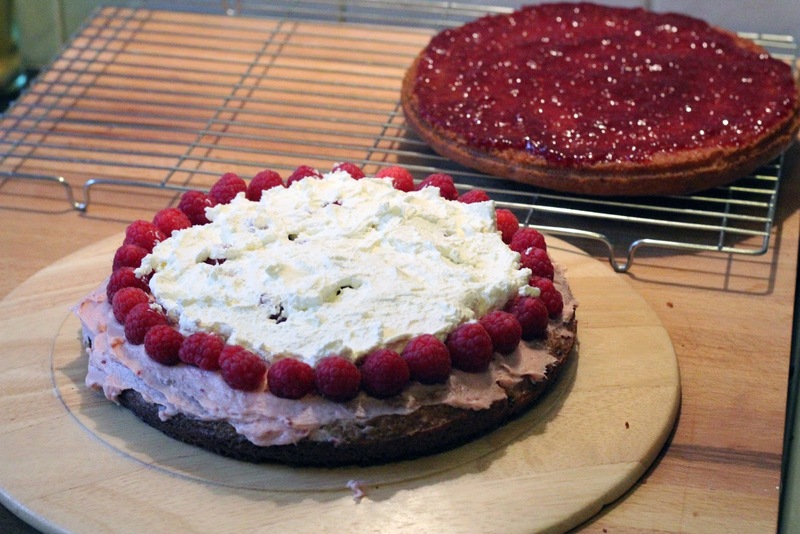 Spread the 150ml whipped cream on top of the raspberries and then spread the raspberry jam over the base of the top sponge layer. Then place on top sponge layer onto the bottom layer. 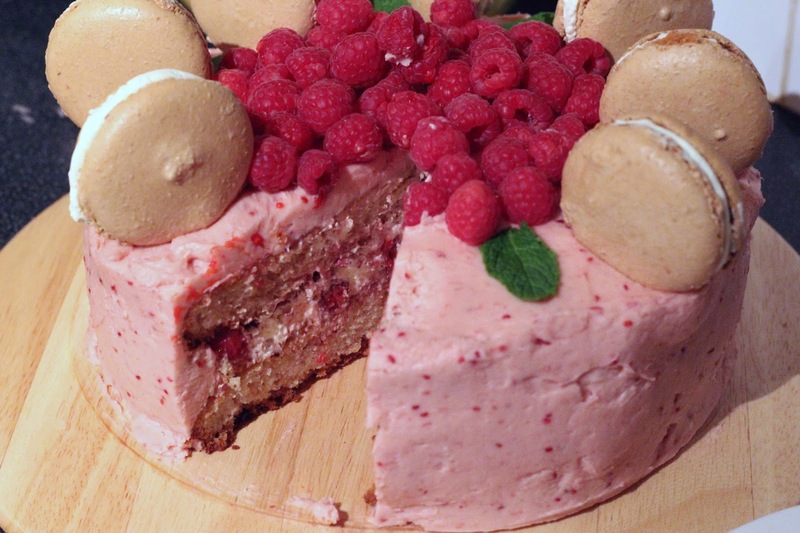 Using a palette knife, cover all sides of your layered cake with the remaining buttercream. 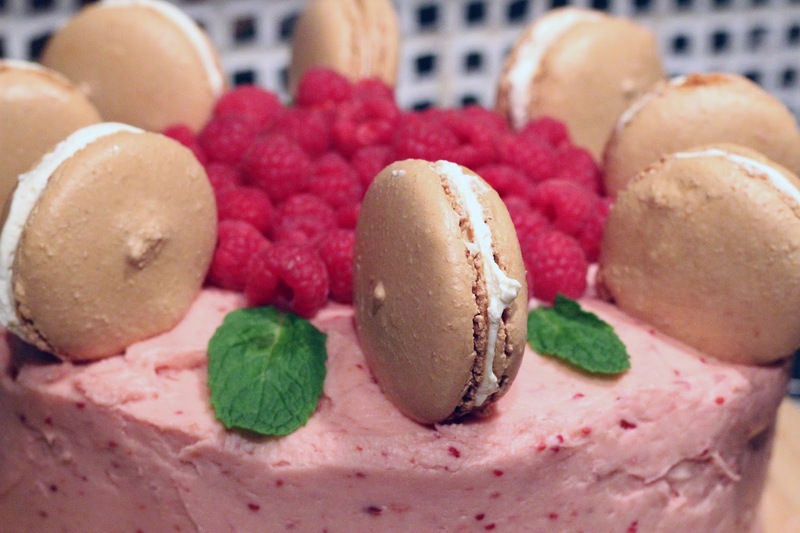 This recipe makes more macaroons than you will need for the cake, so you can choose to add more or save them for later (they keep for about two days). I chose the latter. Source BBC. Line a large baking tray with baking paper. Put the icing sugar, ground almonds and 40g egg whites together in a large bowl and mix to a paste. Put the water and caster sugar in a small pan and heat gently to melt the sugar, then turn up the heat and boil until the mixture starts to go syrupy and thickens. Whisk the remaining 50g egg whites in a small bowl until medium-stiff peaks form when the whisk is removed from the bowl, then pour in the sugar syrup, whisking until the mixture becomes stiff and shiny. For coloured macaroons, add a few drops of food colouring. Tip this meringue mixture into the almond paste mixture and stir gently until the becomes stiff and shiny again. Spoon into the piping bag. Pipe a little mixture under each corner of the baking paper to stop it sliding around. With the bag held vertically, pipe 1½in flat circles onto the lined tray, about ¾in apart, twisting the bag after each one. The mixture should be quite loose to give a smooth finish. When they’re all piped, give the tray 2–3 slams on a flat surface to flatten them. Leave to stand for 30 minutes to form a skin then bake in the oven for 12–15 minutes with the door slightly ajar until firm. Remove from the oven, lift the paper off the baking tray and leave the macaroons to cool on the paper. When cool, sandwich the macaroons together with whipped cream. Then arrange 8 of them on their sides around the top of the cake. 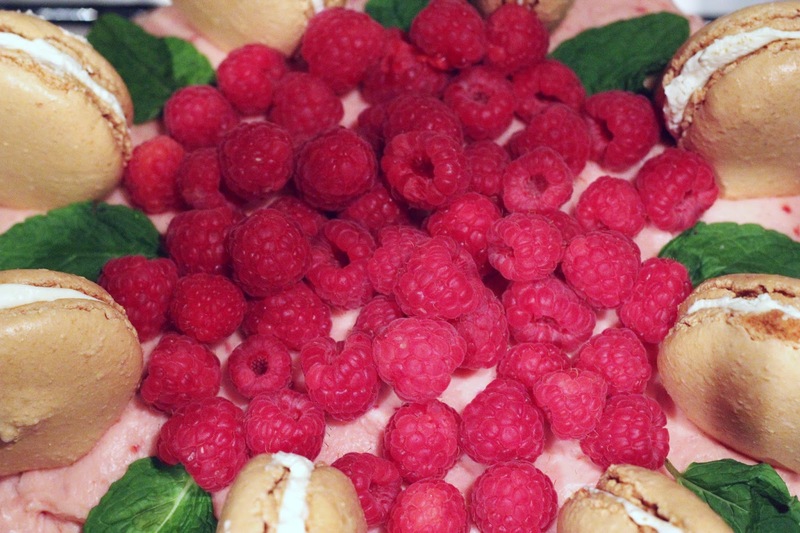 In the centre place the remaining raspberries and arrange mint leaves in the gaps between the macaroons. I'm going to be completely honest with you, I had very limited time to make this cake. Whilst it is perfect for Mother's Day, I actually made it for my mother's birthday. Do you ever get the feeling that you have bitten off more than you can chew when it comes to baking? This is exactly how I felt when I thought maybe making macaroons for the first time when you only have an hour before you have to drive an hour and a half back to your parents' house is maybe not the best idea in the world. I did however pull it off...eventually. One very failed attempt at macaroons resulted in me running around like a headless chicken trying to get everything finished. This actually ended in me making a mistake with the macaroons again, which goodness knows how they ended up not being disastrous. I read the instructions wrong so instead of leaving the macaroons to sit for 30 minutes, I actually cooked them for 30 minutes. ARGH!! So if you choose to follow the recipe as it should be, your macaroons will most probably not be quite as brown as mine. However, they actually were really rather yummy and fortunately for me, my family actually prefer things slightly over done than under. I got away with it this time, but I have definitely learned not to take on more than is humanly possible in only a few hours. On that note, I hope you all have a really lovely Mother's Day.